2 Lisa Frank Sticker Books with Over 800 Stickers - 10 Sheets NEW. 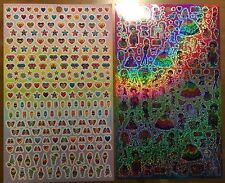 3 X100 Lisa Frank "My Sticker Dreams Collection" LOT- Total of 300 Stickersl!! This lot includes 3 boxes of 100 stickers each. Lisa Frank Sticker Dreams. Each box contains over 100 stickers, that's over 400 stickers total! If for any reason you're not satisfied, we'll work to make things right. This includes 4.5” x 6” sheets or smaller only. One sheet has a spakly background and reflected like a rainbow in photos. Both sheets are shown in the first picture. The second and third picture shows a closer view of each sheet. Dress-Up Dolls - 22 pages with over 200 fashion combinations for Cassie & Tatey Bug - contains punch out clothing and accessories for 2 paper dolls as well as other pages that you can color yourself and cut out. There is coloring and writing on the Coloring Book and Notepad. Coloring Book has a tear. -There is bending on the sheets. I will try to answer ASAP! These do not say acid free. This includes 4.5” x 6” sheets or smaller only. Lot of 28 awesome Lisa Frank alphabet stickers from the 1980s. Mint condition and from a non smoking home. Complete set! See my other auctions for more Lisa Frank and other vintage stickers...selling my personal collection. Free shipping. LISA FRANK 3 Large Sheets Butterfly Puppy Dragonfly Ladybug Cupcake Stickers! This includes 4.5” x 6” sheets or smaller only. They contain 300 stickers! ALL sheets are shown in the picture. This lot consists of 4 BOXES of Lisa Frank's Sticker Dreams. Each box is sealed as per manufacturer and contains more than 300 stickers per box. PUPPY DOG. MOON GIRL. This is a huge lot of Lisa Frank activities. Vintage Lisa Frank Lot of 22 Sticker Sheets Full Size Pages Scrapbooking Stickers Girls Lot of 22 vintage Lisa Frank sticker sheets- probably removed from a sticker/activity book as they are full sized sheets. Every page is marked with “stickers for page...” etc. 16 pages are fully intact and unused. The remaining sheets have one to multiple missing stickers, as shown. Please look carefully at all pictures as any noted defects will be clearly photographed for your consideration. They are in MINT CONDITION! EXACT ITEM IS PICTURED ABOVE. Lisa Frank NEW Collector Set Over 400+ Stickers (5 Sticker Sheets) Unused! Lisa Frank. Sticker Pad 400 stickers. Vintage Lisa Frank Kitten On A Piano Sticker measures 2 inches in diameter and is in excellent unused condition Please see pics! I will be listing more vintage stickers, books and collectibles so be sure to check out my other auctions for more vintage items! HUGE Lot of Vintage Lisa Frank 1980s Assorted Stickers All Different Variations. Condition is New old stock. Shipped with USPS First Class Package. Feel free to ask questions. Dashly the Hummingbird. Prism Stickers S739. Hummingbirds - Roses - Butterflies. The first picture shows all three sheets. The next 3 pictures show the individual sheets closer up. This includes 4.5” x 6” sheets or smaller only. These do not say acid free. Lisa Frank sticker pad with over 500 colorful stickers featuring your favorite Lisa Frank characters! Cover art may vary. The perfect gift for any Lisa Frank fan! Sticker pad has over 500 stickers; Lisa Frank reward stickers. BONUS: 1 FREE Sticker Card. I am sure you will find all your Kawaii needs here! 1 Rilakkuma Plush Charm -- 1 Card Sticker. 1 Letter Set -- 1 Tofu Plush Charm. This includes 4.5” x 6” sheets or smaller only. BOTH sheets are shown in the picture. There are lots of mini shapes and animals. Also a few larger characters. GOOD LUCK! LISA FRANK Stickers! Girls Love to Shop Car Puppy Cats Balloons 2 Sheets! This includes 4.5” x 6” sheets or smaller only. Both sheets are shown in the first picture. The second picture shows a closer view of 1 sheet. These do not say acid free. The stickers are in all different sizes! This includes 4.5” x 6” sheets or smaller only. All 3 sheets are shown in the first picture. The second picture shows a closer view of 1 sheet. These do not say acid free. The stickers are in all different sizes! This includes 4.5” x 6” sheets or smaller only. Both sheets are shown in the picture. I will try to answer ASAP! LISA FRANK 3 Large Sheets Smiles Happy Face Heart Star Rainbow Flower Stickers! This includes 4.5” x 6” sheets or smaller only. They contain 300 stickers! ALL sheets are shown in the picture. These do not say acid free. New Lisa Frank Music and rainbow stickers corner square sheet. Lisa Frank. LISA FRANK Stickers! Flower Power Peace Signs Butterfly 2 Large Sheets! This includes 4.5” x 6” sheets or smaller only. There are all sizes of peace signs with flowers, butterflies, dragonflies, and hearts. There are large stickers (1.5" tall) and teeny stickers (1/8") and many in between! This includes 4.5” x 6” sheets or smaller only. BOTH sheets are shown in the picture. There are lots of mini shapes and animals. LOTS of small characters. GOOD LUCK! Stickers hearts stars animals. Girly stickers.